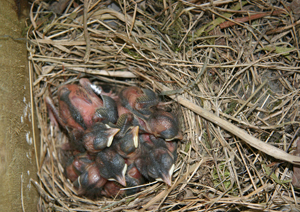 The Garden Nesting Survey is one of a suite of projects carried out in summer 2010 under the BTO Nesting Neighbours banner. We ran the survey in an attempt to find out which birds were nesting in gardens across Britain and Ireland. This survey has demonstrated the importance of gardens as a nesting habitat for a wide range of different species, and revealed some interesting patterns in species’ nesting habits. An examination of the results has revealed some interesting information. If you enjoyed taking part in the survey, or are interesting in getting involved with looking for nesting birds in your garden or further afield, the BTO runs two other surveys which monitor nests, Nest Box Challenge and the Nest Record Scheme. Joining either of these schemes means that information about any nests you find can be used for monitoring and investigating wider national trends, and understanding more about the breeding behaviour and success of our birds. We are very grateful to the John Spedan Lewis Foundation and Gardenature (who helped to fund the set up of this survey.